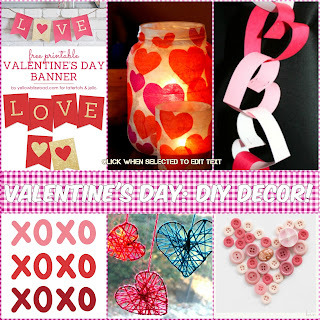 If you read my first post this week, you will know that this week's theme is Valentine's Day! If not, go take a look at some of my favourite crafts. 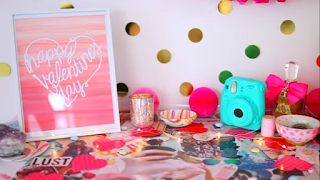 For today I'm going to be showing some of my favourite Valentine's DIY Decor ideas! Valentine's Day is such a short holiday, I don't really see the point in buying and spending lots of money on decorations that will only be up for a short time. Having said that, any excuse to decorate and make the most of a celebration, is fine with me. So here are some of my favourite cheap and easy decorations for my room. Sneakily, I also threw in a few actual crafts which I didn't put in Monday's post because I thought it may be a little complicated for small children. Disclaimer: I've found all these ideas on Pinterest but I also remember doing them myself when I was younger. I have included links to the original posts but I also found it very annoying when I would go on Pinterest and then that post would take me to another and another and then finally the original with the actual instructions. So while you can have a look at the original posts, you don't need to click on them to be able to do the activity, unless you want more detail. A really simple banner is perfect for an easy Valentine's themed decoration in any room. Click here for the banner pint out; make sure to print it out on card for best results. After cutting it out, attach to ribbon by either glueing on make some holes in the letters and thread it through. On the link there is also some other ideas with the same theme. I thought I'd throw in another banner in case you don't have a printer or don't want to waste money on printing red ink. Trust me, I know the battle of limiting printer ink use! This banner I think is so cute and even easier if anything. Basically cut strips of the same length of card and then staple them altogether. Instead of doing straight up circles and linking then up, just fold the sides together and add a stable either side. Of course, you could glue them together as well to give a little more of a finished look but it's a little more fiddly. I love how they use different shades of the same colour! Another easy way to spruce up your room is using free prints. Pick and select the one you want and then print it. You can simple BluTac it to the wall or for Valentine's week, simply swap out a photo already in a photo frame that you have and replace it with a Valentine's image. There are so many to choose from but here are my favourites. You could also just design your own by writing a favourite quote, decorating it and then print it out! My favourite is definitely the XOXO Ombre and the Alphabet. What's yours? I told you there are so many free prints available on Pinterest if you just look. If you didn't like the ones above, here are some more traditional ones! I actually found these printables through Aspyn Ovard on YouTube who had printed one off for her Valentine's video. While a child is shown on the website link, I personally wouldn't want a child to be messing with slippy glue and glass. I remember doing a similar project when I was younger on a glass plate for christmas and it turned out super cute! All you need is tissue paper and PVA glue. Coat the glass is PVA glue and then strips of thin white tissue paper. 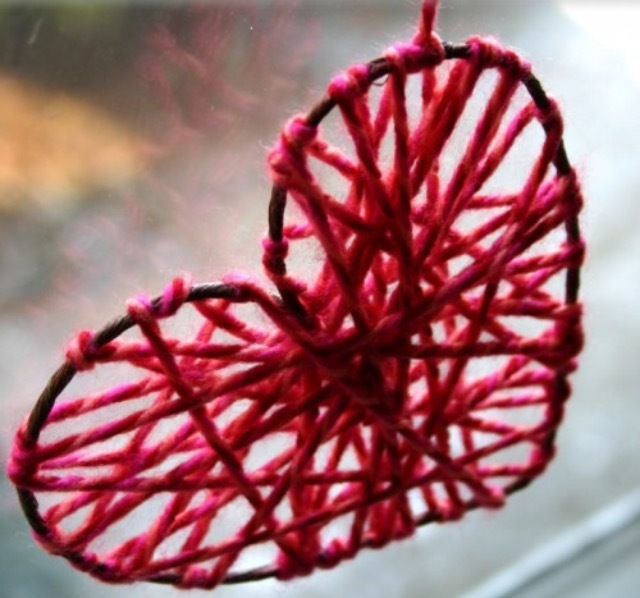 Once covered in a thick layer, then decorate with hearts and coat with a final layer of glue. Make sure to let it dry thoroughly for a few days before using it but then you can use. These make super cute jars, votives or even plates! I couldn't help but add in a little cheeky extra DIY Craft decor. The reason this is a bonus is because it's a little harder and more expensive to make compared to the others. This one seems a little too complicated for kids but I think it looks so amazing and artistic. I can't wait to make these myself! Using floral wire cut it to the size you want and then twist the ends together to secure the heart shape. Wrap yarn around the wire until you get your desired effect. I think these look so cute in different size and color but would also look beautiful in different shades of pinks and reds.